“Sun City” is a vastly superior song to the treacly “We Are the World”, the more famous megastar single from 1985. 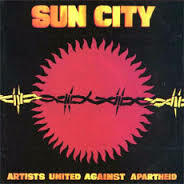 Put together by Steven Van Zandt, who had left Bruce Springsteen’s E-Street Band the year prior, “Sun City” was the first all-star song with the goal of raising political awareness rather than money for charity. 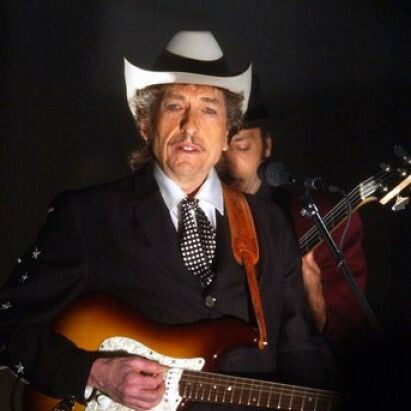 Bob Dylan was one of the earliest stars to sign up for the project – he had been working with Van Zandt on tracks for Empire Burlesque (tracks that would, sadly, be cut from the album), so the connection is pretty direct and easy to understand. Unlike on “We Are the World”, Dylan doesn’t have a big signature part on this song, and it’s a lot more difficult to pick out his contribution. In the video he’s even more obscured, he basically show up around 4:16 and points his finger at Jackson Browne. They both sing the line “Relocation to phony homelands” at about 4:29 – listening to the song without watching the video he’s tough to pick out, Peter Garrett sort of overwhelms Dylan’s line with his own following one. That’s it. So I’m not really sure what there is to say here from a Dylan perspective. I like the song a lot, still to this day. Probably to the same degree that I dislike “We Are the World”. The song was only a limited hit. Some radio stations refused to play it because of the line sung by Joey Ramone: “Constructive Engagement is Ronald Reagan’s plan”. No criticisms of Reagan on 80s pop radio, thanks very much. Van Zandt has written very interestingly about all of this, and about his engagement with the issue. Warning: Reading this article may cause you to become extremely irritated with Paul Simon! Thanks for sucking me into a giant time hole, Bart. I loved this EP in the 80s. I did not even remember that Dylan appeared on the song. Better, non-Dylan related parts of the EP were the Gil Scott Heron led “Let Me See Your ID,” (from which I always remembered the Fat Boys verse) and the Bono W/Keith Richards and Ron Wood “Silver and Gold,” which would later show up on Rattle and Hum as a U2 song.